“Write what you know,” people say. And what they know, mainly, is themselves. So people write about themselves. David Horowitz does, a lot. But you are glad he does, for several reasons. First, he does it very, very well. Second, he has led an interesting life. Third, his life has corresponded to our times. 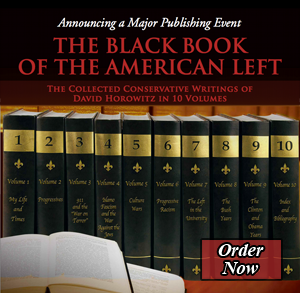 This volume is the first of ten — ten volumes collecting the “conservative writings of David Horowitz.” He has been a conservative since about 1985, when he was in his mid-40s. Says David, “My life as a leftist began with a May Day Parade in 1948, when I was nine years old, and lasted for more than twenty-five years until December 1974 . . .” What about the other ten years? The decade between 1975 and 1985? In those years, David informs us, he was essentially out of politics, finding his way along. The series overall is called “The Black Book of the American Left.” David says he is a hedgehog rather than a fox — someone who knows one big thing rather than someone who knows many things. I would dispute this. David knows a range of things, including literature, the discipline in which he was trained, academically. But it’s true he knows the American Left, inside and out, and, if you have to know one thing, that’s a big, big thing to know. I will not try to recapitulate Radical Son — David’s renowned autobiography, published in 1997. But let me give you a few basics from his life, drawn from the present volume. His parents were Communists, as you know: Not many nine-year-olds just wander into a May Day parade. David grew up “a sheltered child in a Marxist bubble,” he says. His parents believed in the Soviet dream. They thought they were fighting for the poor and the powerless, for a shining future. The Soviet dream was a lie, however. He went to Columbia University, in his hometown of New York. “I viewed my college education not as a step on a personal career path but as preparation for my life mission, which was to participate in a revolution that would change the world.” From Columbia, he went to Berkeley, for a master’s in English — and to further the mission, of course. He organized one of the first anti-Vietnam War rallies. That was in 1962, when the war was hardly yet a war. Then he went to England, where he worked for Bertrand Russell, the famed intellectual who had become a leader and symbol of the radical Left. In this period, David met with a Soviet official, Lev, who, of course, turned out to be a KGB agent. At one meeting, Lev gave David a Parker fountain pen. “I didn’t know how to refuse it without insulting him.” At the next meeting, Lev stuffed an envelope full of cash into David’s pocket. This, David refused, indignantly. Later, Lev asked David to spy — which David refused even more indignantly. They never saw each other again. Whatever David was in that period, he was not a Soviet spy. David Horowitz had two Kronstadts, I think. One of them was more important and more personal; the other was more global, if you will. “Kronstadt”? This term refers to the Kronstadt rebellion of 1921, in which Soviet sailors, soldiers, and others turned against Lenin and the Bolsheviks and were, of course, crushed like bugs. Since then, some ex-Communists and ex-leftists have spoken of their “Kronstadt.” The term has a couple of definitions: It can refer to the moment of one’s disillusionment with the Party; or it can refer to the moment at which one took a stand against the Party. In any case, this moment, for some, was the Nazi-Soviet pact. For others, it was Khrushchev’s “secret speech.” For others, it was the suppression of the Hungarian Revolution, or the suppression of the Prague Spring. Many, of course, have never quite had a Kronstadt. Let me tell it very briefly: David arranged for a woman named Betty Van Patter to work as a bookkeeper at a Panther-run school. Soon, they murdered her. You recall David’s dates for his “life as a leftist”: May Day 1948 until December 1974. That was the month of Van Patter’s murder. David’s other Kronstadt, I gather, was Vietnam — the results of that war, I mean. As David himself puts it, “More people — more Indo-Chinese peasants — were killed by the Marxist victors and friends of the New Left in the first three years of the Communist peace than had been killed on all sides in the 13 years of the anti-Communist war.” He quotes Jeane Kirkpatrick, a Truman Democrat who served as U.S. ambassador to the United Nations under Ronald Reagan, and, afterward, joined the Republican party: “How can it be that persons so deeply committed to the liberation of South Vietnam and Cambodia from Generals Thieu and Lon Nol were so little affected by the enslavement that followed their liberation? Why was there so little anguish among the American accomplices who helped Pol Pot to power?” In David, there was anguish. David, remember, vowed to be different from his parents: He would never “be loyal to a movement based on a lie or be complicit in political crimes.” It had not worked out that way, however. And “the William Buckleys and the Ronald Reagans and the other anti-Communists” who told the world that life was ghastly under Communist regimes — they were right. They were routinely denounced as liars, but they were right. Those denouncing were the liars. A switch from left to right is not necessarily a bright career move. You give up a lot: including entrée to the most respected publications. David found doors shutting in his face — not just at Left publications, but at “mainstream” publications, particularly the New York Times. In going from left to right, you go from the Kingdom of the Cool to the Kingdom of the Much Less Cool, at least. The New Leftists, David’s old comrades, found homes in all the respected publications. They prettied up, airbrushed, and prospered. In the course of My Life and Times, David quotes some famous words of Kundera: “The struggle of man against power is the struggle of memory against forgetting.” David is a rememberer, not a forgetter. “Oh sure,” he says, “like Gitlin and Hayden I would prefer to recall the glory days of my youth in a golden light” — referring to Todd Gitlin and Tom Hayden, two stars and definers of the New Left. But “for me the era has been irreparably tarnished by actions and attitudes I vividly remember, which they prefer to forget.” David is like a witness to a crime — to many crimes — who won’t shut up about what he saw while others just want to glide on. He makes the Left hugely uncomfortable, for instance in his use of the words “we,” “us,” and “our.” A sample: “The results of our defense of the Cuban revolution are indisputable. Cuba is an island prison, a land of regime-induced poverty, of misery and human oppression greater by far than the regime it replaced.” Who on the left could stand to hear that? When people talk of the Sixties, they tend to talk of “crazy times” that were also “idealistic times.” Yes, yes, some people went too far — but those people were few in number, and most people’s hearts were in the right place. David spoils the party by saying, No. The fog machine operates ceaselessly; David dispels the fog. In 1990 or so, someone introduced him to an audience as “a former peace activist and civil-rights worker.” David got a kick out of that: He had been a Marxist revolutionary! Today, fog covers the Black Panthers. Huey Newton was basically MLK with an edge. Just as the Communists had been “liberals in a hurry,” the Panthers were civil-rights activists with a streak of impatience. This myth is intolerable to anyone who knows about the Panthers.
. . . many argued that if we pulled out there would be no consequences for the Vietnamese people. The squeals following that speech were long, loud, and livid. And guilt-tinged. Early in his career, he did some teaching at Berkeley and elsewhere — but he has done most of his teaching in his writing. The term “public intellectual” makes some of us gag, but that’s what David is. He has read a lot, across the spectrum: He knows his Marx and his Mises, his Gramsci and his Kolakowski. He wears his learning lightly, though: It peeks out now and then, as when he quotes one of these gents (or quotes Shakespeare, for that matter). One quality of David’s writing is self-criticism — not in the Maoist sense, but in a true one: David is unsparing about himself and the mistakes he has made. Would that his critics were half as honest. I’ll tell you what the “smart” view of David is: He was a radical of the Left who became a radical of the Right. He was an extremist then and is an extremist now, with the same nasty and flamboyant style. Express this view, and almost every liberal and conservative head will nod: “Yup, yup, that’s how it is.” It is nonsense. No one will contradict you if you say it — but you’ll be a fool. I cherish a comment that Hendrik Hertzberg, the New Yorker writer, once made to Collier & Horowitz. He said, “You were apologists for Communism then and you are apologists for anti-Communism now.” They are not merely apologists for anti-Communism; they are anti-Communists, as all decent people are (though they will not necessarily be published in The New Yorker). If you want to classify David politically, you can call him a conservative — with a healthy dose of Hayek in him. “My life experience had led me to conclude that not only was changing the world an impossible dream, but the refusal to recognize it as such was the source of innumerable individual tragedies and of epic miseries that human beings had inflicted on each other in my lifetime through the failed utopias of Nazism and Communism.” Seldom will you read a more conservative sentence. And you will read many more like it, in David’s collected writings. He is constantly inveighing against ideologies, party lines, rigidities. David is known as a hothead and flamethrower. A rhetorical goon. He can be that. He can also be coolly cerebral. And he can be elegiac, lyrical — as in personal memoirs such as the one about his late daughter, A Cracking of the Heart. He has many moods, many styles. And make no mistake: He can do style. Christopher Hitchens was supposed to be the most stylish writer and polemicist of his time. But consider an exchange between him and David on the radio. David said something rude — i.e., something true — about Castro. And Hitchens, with his practiced sneer, said, “How dare you? How dare you?” David replied, “Christopher, aren’t we getting a little old for how-dare-yous?” The more stylish person in that exchange was not Hitchens (who, like Paul Berman, would do some political sobering up). As I was reading My Life and Times, I kept writing in the margins, “True, true!” And as I read about David’s thoughts and experiences, I couldn’t help thinking of my own. Other readers will find the same, I’m sure. I kept thinking, “Yes, that’s what I saw, that’s what I heard, that’s what I felt.” Take the matter of human rights: The people around me constantly yelled about Pinochet’s Chile, Marcos’s Philippines, and, above all, apartheid South Africa. And yell they should have. But what about the people behind the Iron Curtain? And in China, North Korea, and Vietnam? And in Cuba? If you prick or torture them, do they not bleed? Aren’t human rights for them, too? Obviously, no one can agree with David on every point in the hundreds of pages of Volume 1, or in the thousands of pages of the volumes to come. That would be absurd. In all likelihood, David doesn’t agree with David on every point. (Do you agree with everything you’ve said for the past 25 or 30 years?) But I always want to know what David has to say. Early in that Columbia speech, he praised a professor, saying, “He was there . . . to teach us how to think and not to tell uswhat to think — therefore to respect the divergent opinions of others. I am afraid this is a vanishing ethos in our culture and a dying pedagogical art in our university classrooms today.” Oh, yes. Like everyone else, David will sometimes tell you what to think. But he is more interested in suggesting how you should think. Once he was asked, “Do you ever feel that you are wasting your breath? Do you think that truth will ever matter? No matter what you prove or disprove, in the end the truth will remain in the shadows of what people want to hear and want to believe.” David answered, “I agree more than I care to with this observation.” For my part, I can say that David has not wasted his breath. He learned important things in the first stages of his life, and has learned important things since. He has wanted to impart what he knows, and he has many beneficiaries. Everyone? Of course not. Enough beneficiaries, though — more than most ever have. What has driven him, I think, is what drove Whittaker Chambers and lots of others who left Communism and dedicated themselves to anti-Communism: a desire to tell the truth, and to have other people know the truth. A desire to be free of lies, and to counter them. “Live not by lies!” Solzhenitsyn implored, during the long years of the Soviet Union. Lies want to govern everything, and do, if you let them. David was sick of lies: about the Soviet Union, about the Panthers, about Vietnam, about everything. And he burns to know and tell the truth, insofar as that is possible. This quality — a respect for the truth, an aversion to lies — has always existed in him, even if it has been suppressed or superseded at times. Age 14, he was walking across the Triborough Bridge to attend a rally for Julius and Ethel Rosenberg, the atomic spies for the Soviet Union. A political mentor was explaining to him that lying was justified, for revolutionary purposes. David knew this was wrong — felt in his stomach that it was. “The renegade Horowitz,” even then! “Great is truth,” they say, “and will prevail.” It will, yes — but even if it didn’t, it would still be great.